FRESH OUT OF BED Good morning loves! I can't believe that the big Lunar New Year holiday and the long weekend was just over within a wink of an eye (I made a promise to myself to keep my time off the blog and trust me it was hard..) Right now I'm feeling super positive, well rested and energised with with lots of updates to catch up! Some of you may also have known that I had an eyebrow embroidery done about three weeks ago, so during the last couple of weeks it had been my healing time.. Plus I was so caught up with all the painting and spring-cleaning going up at home that I can finally can share my whole experience with you guys today! I wanted to show how my brows look like so these pictures were taken sans-makeup (ok, please make an exception for some lip color cause you guys already know how incredibly pale I can look without them hehe) To me, I feel that eyebrow embroidery is kind of like a beauty treatment that's supposed to give you really neat and well-shaped brows whereby you can just head out in the morning without needing to fuss over your brows every morning and it's also time saved at the same time. Sometimes it can just take an incredibly loooonnng time to get them right and trust me when I say that, because I know that best. So let's have a little eyebrow talk! How do you girls shape and maintain your brows? I know some of my friends who usually go for eyebrow threading to shape their brows from time to time but that looks super painful! I accompanied my friend on one occasion and she got all teary eyed from it.. it was even painful to watch! I'm going to admit I that I haven't tried that personally (I have a zero tolerance level for pain). 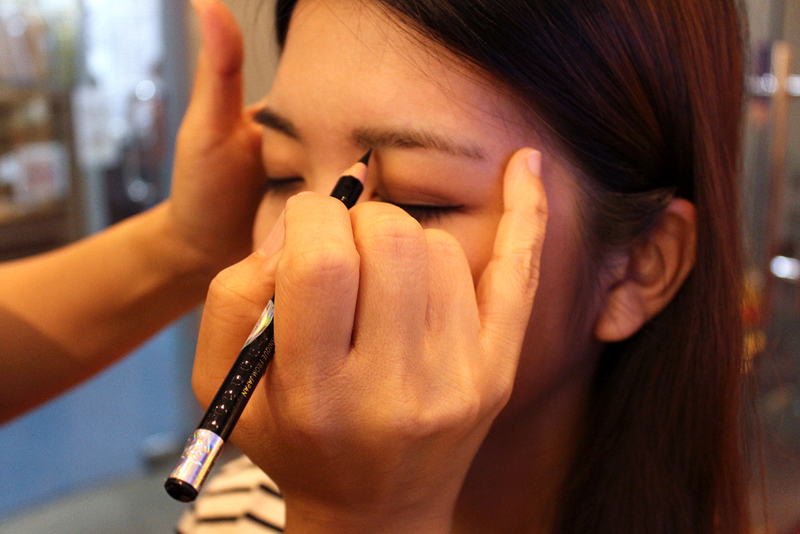 I did experience a bit of eyebrow plucking (I usually head to a salon to groom my brows when I was younger.. I opted for a shaving method but the lady insisted there was one or two that she HAD to pluck so it was a total ouch!!! moment.) I mean, does anyone even endure the pain factor? Ever since then I have always been using a shaving method to shape my brows.. Though it's painless, I'll have to shape them more often which can be pretty time-consuming ugh. Now we're just done talking about the removal of stray hairs.. there's still a need to draw them! One thing I really regretted doing when I was younger was to over-shave my brows (now that's kinda embarrassing..) My mum didn't allowed me to shape them when I was younger, so until when I was about 16, I started experimenting it myself. (What a wrong wrong move...) I looked back at my pictures where I saw that I only had an incredibly thin line! That must have looked sooo funny. But I'm not going to lie and say that it was a breeze to draw my brows.. sometimes I have to wipe them off and re-do it again along with a funny patch since I've also cleaned off my foundation with it.. Story of my brows.. Does this sounds familiar to you girls or am I alone in this?? 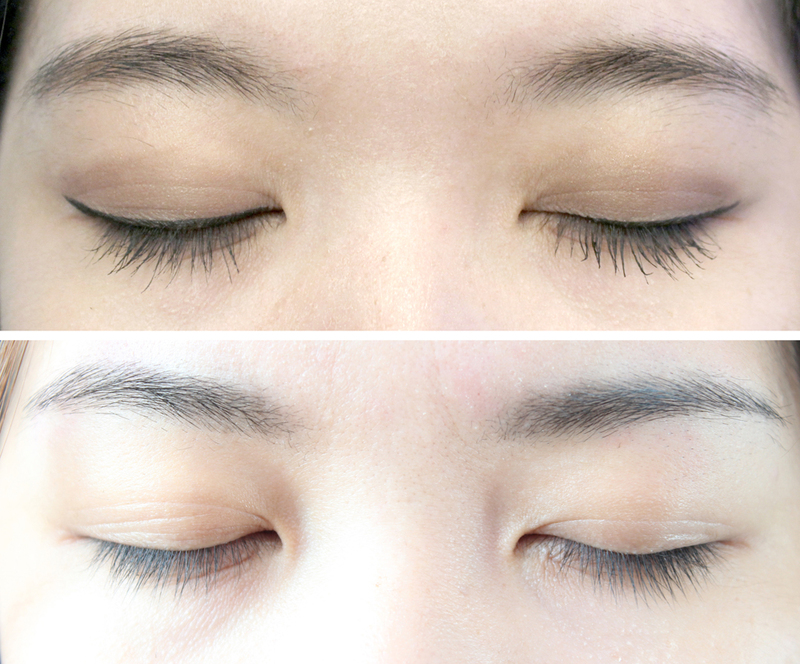 So a couple of weeks ago I went down to Allure Beauty Saloon (located at Tiong Bahru Plaza) for an eyebrow embroidery session. Have been hearing and reading so much about it! 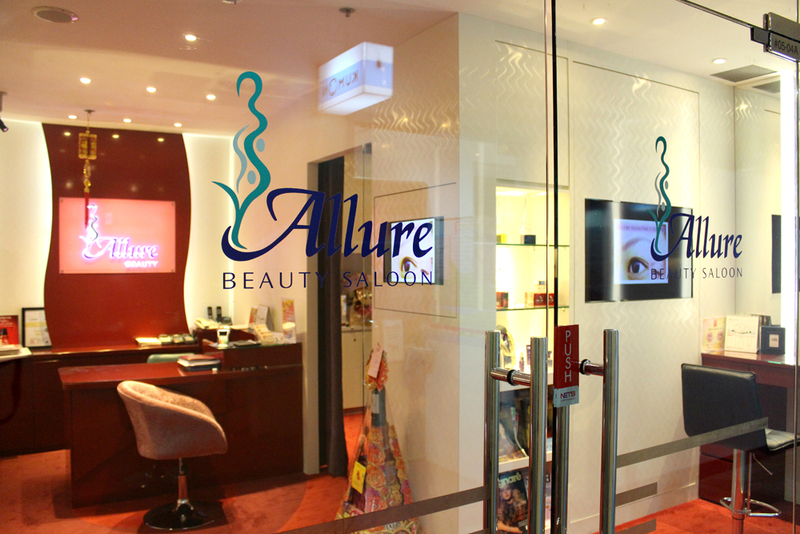 Allure Beauty specialises in the art of eyebrow embroidery and from what I understand, it's their forte and they have been leading in the market for the past 11 years and counting! Feeling super relieved that I'll be in good hands especially when it comes to this. I mean, although eyebrow embroidery is not going to be permanent like tattoos (our facial shape is going to change with time so having permanent brow shapes is a no-no) , they will still last for about a year and a half up to three years. So the risk of having poorly shaped brows for the next few years isn't exactly my cup of tea.. 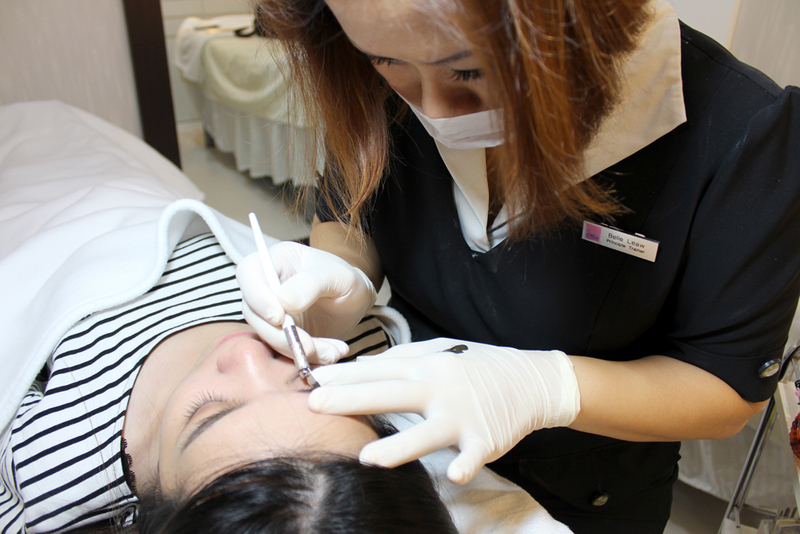 Different from other saloons, Allure Beauty started the eyebrow embroidery session by applying the numbing cream first before consultation and shaping of brows. 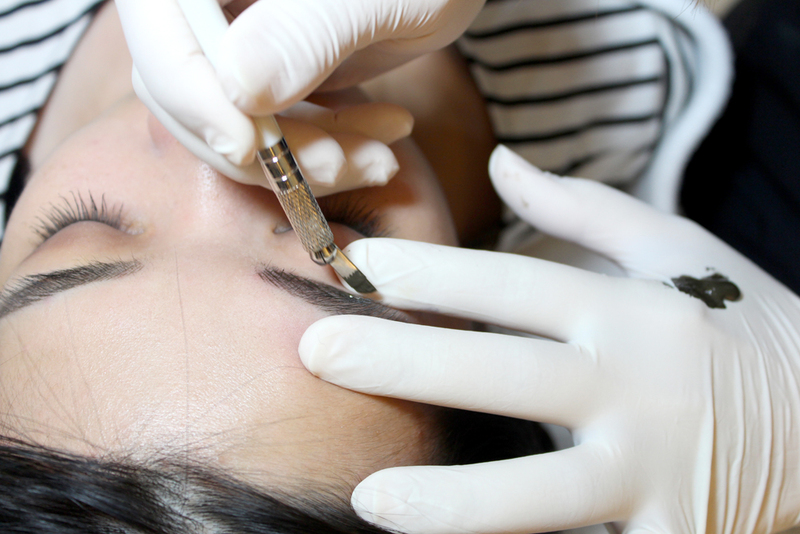 It ensures that there's ample time for the numbing effect to set in and plus, brows that are shaped later on wouldn't be smeared by application of numbing cream. 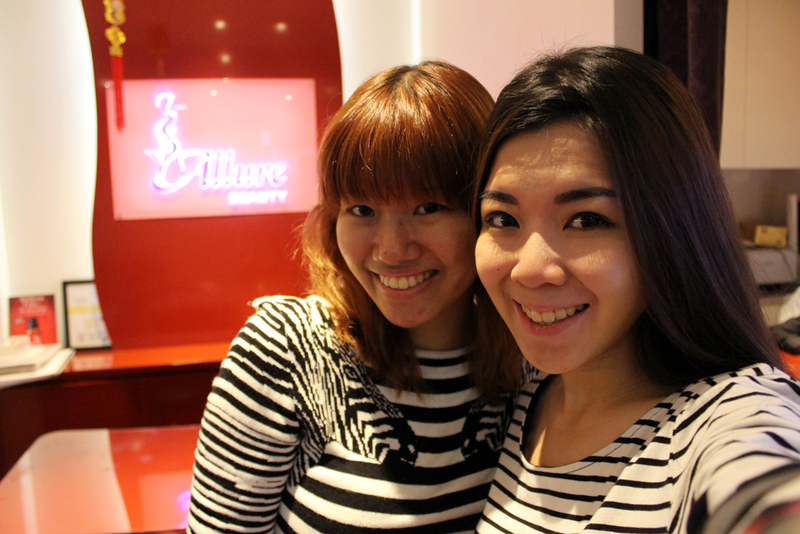 That's Belle, the principal trainer of Allure Beauty who's going to shape and do my brows for me! 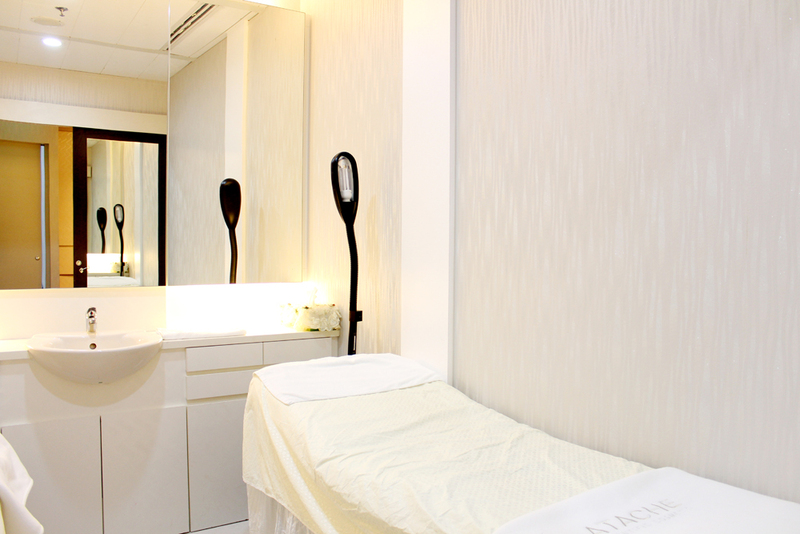 One thing that's very assuring was how she shared with me that all brow therapists at Allure Beauty undergoes very strict training and practical exams, where they must be personally approved by Angela Tnee (founder and managing director of Allure Beauty). What's funny was that it seems that we had different views about my brows! I was looking at the mirror thinking that one side of the brow seems to have a slightly arch than the other. Sooo we spent lots of time (or rather it's Belle..) trying to shape it again to my preference. We finally took out a camera phone to snap it to see how it looks like and I was like oh crap she's right. Instead the one which I preferred (when I looked into the mirror..) didn't turn out nice on pictures. Why mirror, why?? Thankfully Belle has a super good eye! Doing some final touch up and reshaping again before the embroidery session starts! 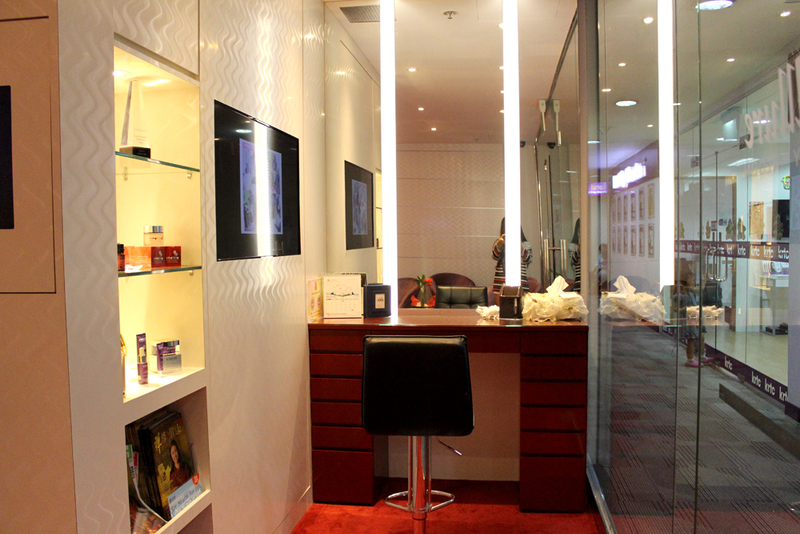 Allure Beauty practices very strict hygiene standards, where a brand new sterilised blade and ink will be opened for each customer and any leftovers (ink, etc) will be discarded after every usesession. Belle's embroidering my brows using a stroke by stroke technique with brown ink. It was totally painless!!! It felt more like it was a ruler that's scratching along my brows. Belle's also super meticulous. She makes sure that my brows are neatly shaped when I'm seated upright! After Belle's done with the shaping of brows she also applied some cream on my brows. I think that's when I felt a little bit of a prickly sensation but that quickly passed in a few seconds. Here's the after care products! An after care tips card to make sure that I don't forget what I should (or should not) be doing.. some stickers for my brows when I bathe (they can't come into contact with water for about a week) and a soothing cream to sooth and protect the color. I find that it actually helps when my brows were itching due to the healing process. I mean, that's one of the weird feeling in the world... talk about having itching brows and you can't do anything to it! Maybe except to put on more soothing cream to ease the itch..
Belle again! The principal trainer of Allure Beauty who did my pretty and neat brows for me. Upper: BEFORE | Erm.. (..I apologise) but that's my messy brows..
Holy cat. I can't believe I had such messy brows! It didn't even dawn upon me until I put both pictures together for a comparison... Now that's a little embarassing.. But of course, there's still going to be stray brow hairs but I find that it's a lot easier to trim them away now that there's a defined shape! Definitely liking my eyebrow embroidery which Allure Beauty had did for me. I'm just so happy that the color have faded into a very natural tone that's very similar to my original brows color. It looks very natural (yaaay!) and right now my morning make up routine just got a whole lot easier hehe. It's just awesome, I mean right now when I head out to the streets without any make, I wouldn't have to worry about any sparse areas of my brows.. or whether they had been poorly drawn.. (or who knows I might even have drawn some uneven eyebrows..) so yep it's a looot of time saved. However on days when I'm putting on heavier make I'll still prefer to use my brow pencils to further darken them a little bit. Personally, I really do think that our brows can really shape or even change how we look so I'm so glad to have my eyebrow embroidery done! it looks pretty! 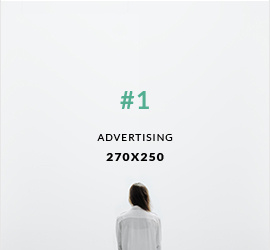 but so pricey! Very pushy. The therapist keep trying to sell her products. Never listen to customers! Will not go back again.